Growing: Â Easy to moderate One of the almost pure marijuana strain with 95% sativa and 5% indica, Brainstorm Haze G13 is the result of crossing Brainstorm Haze pheno as mother and G13 Haze as father. 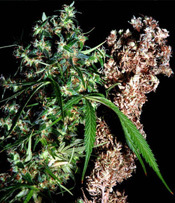 Â The Result is a cannabis strain that gives high yield and at the same time has shorter flowering period s compared to a pure landrace sativa strain. Â It can be grown indoor and outdoor and even beginners can venture in growing this weed as long as the basics of marijuana growing are followed.Flowering time for this strain can be expected when it reaches 80 days from the moment it enters vegetation. Â It will grow compact buds all over and emit a sandalwood scent which will be carried to its taste along with a strong full-bodied smoke. Â The effect when smoked is uplifting high seconded by a strange body effect that is indicative of its remaining indica strain. This is the smoke I prefer whenever I need to stay late at night writing for press releases.Â Really strong high with uplifting and relaxing effect thatâ€™s almost rare.